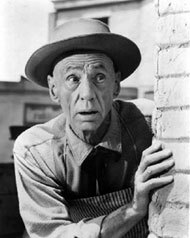 If for nothing else Hank Worden made an enduring mark in western film history for his memorable role of old, bald, laconic fool Mose Harper sittin’ and a-rockin’ in “The Searchers”. Born Norton Earl Worden in Rolfe, IA, July 23, 1901, his father had been an engineer on the Denver and Rio Grande in Colorado. When his father’s sister died in Missouri, the family moved there to run the farm for two years. The family then moved to eastern Montana where Norton became an accomplished horsebacker. He attended the University of Nevada and Stanford University in Palo Alto, CA, (where he acquired the nickname Hank) studying to be an engineer. Enlisting in the Army to become a pilot, he washed out of flight school. An expert horseman, Hank hooked up with various rodeos which brought him eventually to Madison Square Garden where he and fellow cowboy Tex Ritter were chosen for roles in Broadway’s “Green Grow the Lilacs” (‘31). 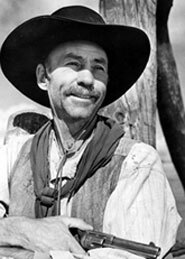 After the show completed its road engagement, Hank worked as a dude ranch wrangler in Cody, WY, while Ritter stayed in New York and found work on CBS’ “Bobby Benson” radio serial. “I guided a couple of years in the Grand Canyon during the Depression,” Hank told Tom and Jim Goldrup for their FEATURE PLAYERS Vol. 1. “You had to be able to entertain so I used to sing ‘Old Chisholm Trail’ and that sort of thing and I did a little jig. People used to tell me I ought to get over to Hollywood, and I finally did. I [was] working on a dude ranch in Palm Springs. [Comedienne] Billie Burke was there and she thought I was good,” Hank explained, “So when I came to L.A. she called up Paramount, who was casting extras, and I got on ‘The Plainsman’ with Gary Cooper (‘36),” although several other films Hank worked in were released first while “The Plainsman” was in post-production. Nearing 50, Hank’s striking tall, lanky, bald appearance and his western-drawl voice endeared him to anyone who saw him. 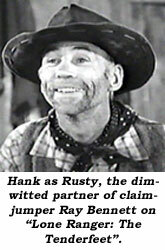 Hank is particularly memorable as Buck Jones’ sidekick, Skeeter, in “Stranger From Arizona” (‘38); performing an amusing little dance to a zesty version of “Wait For the Wagons” in “Black Market Rustlers” (‘43) w/The Range Busters; as a loveable but dumb deputy in Tex Ritter’s “Mystery of the Hooded Horsemen” (‘37); as Bob Baker’s sidekick Cherokee in “Ghost Town Riders” (‘38); as one of Charles Kemper’s outlaw nephews in “Wagonmaster” (‘50) w/Ben Johnson; as Poordevil the Indian that “No got whiskey” in “The Big Sky” (‘52) w/Kirk Douglas; as Sampson, the town blacksmith turned deputy for Forrest Tucker in “The Quiet Gun” (‘57); as Parson in John Wayne’s “The Alamo” (‘60); and even at 89 as the world’s oldest room-service waiter in David Lynch’s eerie “Twin Peaks” TV series (‘90-‘91). No stranger to TV, Hank worked on “Sheriff of Cochise”, “Disney’s “Davy Crockett and the River Pirates”, “Lone Ranger”, “Jim Bowie”, “Tales of Wells Fargo”, “Rawhide”, “Wagon Train”, “Daniel Boone”, “Lancer” and “Gunsmoke” among others.